The ARROW board will meet on Tuesday, April 2 at 7:30 p.m. at the Washtenaw Chapter of the American Red Cross, 4624 Packard Rd. Any interested ARROW members are invited to attend. Welcome to our new site. We have re-designed the site in order to make it easy to find the information you need, and to include some of the more modern tools available in web design. Whenever a new site is released, there may be an item or two out of place. Please feel free to take a look at the site, and tell me what you think. After long being tired of the poor performance of my HF9v with 18 radials, I finally sold it off to a fellow ARROW club member for what I had invested (not a lot) and was left with the radial field in the woods (now mostly buried after 3 years). I let it sit for a while, wandering out there every few weeks to prune a few branches and stare at the mast and wires sticking out of the berm between my yard and the freeway. I went by it when I was re-working the big horizontal loop, which broke around Labor Day, and kept thinking of what to do … pull up the radials? That seemed like a shame. Or put them to use them somehow else? KD8MKE John I. Hritz, Jr.
Hope to see you all at the next Arrow club meeting on Dec 9th at the Red Cross chapter 4624 Packard Rd. 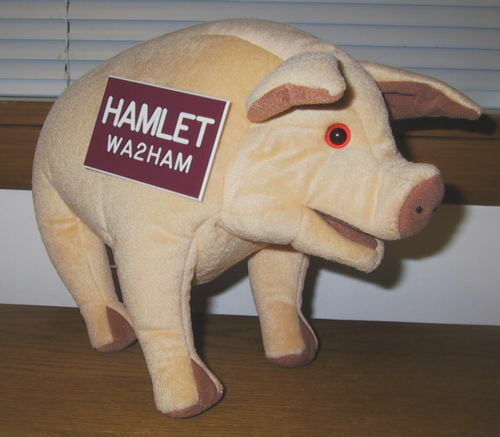 Meet Hamlet, the newest member of the WA2HOM team. Mostly he just sits around and chews the fat, but I’m trying to teach him CW. The Big Horizontal Loop Goes UP! And down! And up again! KD8IPN April 2, 2009 January 16, 2010 No Comments on The Big Horizontal Loop Goes UP! And down! And up again! Spring contest season demanded a new antenna that would handle 160m with some efficiency and compliment my other antennas. I settled on the >1 wavelength horizontal loop for its multi-band potential, relative invisibility, and ease of matching. Anything over a wavelength on 160m (540′ length) would be sufficient, but longer is better, as it lowers radiation angles and improves performance. Since I reconnected the coax to it, my vertical dipole – a tribander driven element hung from a high tree branch – has still not seemed to work well. I would switch back and forth between it and my 20/40/80 horizontal fan dipole, and the horizontal was always at least an S-unit better. In the WPX SSB contest the vertical dipole was only better when the signal came from directly off the end of the horizontal dipole, and I began to think I had water in the coax.